former name: Felis concolor means "cat of one color"
Cougars, also known as mountain lions or pumas, are native to Washington state. About 2,500 live in this state, double the populations of the early 1980s, and their numbers are growing. Description: Cougars are carnivores. They are elusive, secretive animals rarely seen in the wild. Although their usual prey is deer and other wildlife, it is possible, although rare, for them to perceive humans as prey. The animal is identified by its large size, cat-like appearance, uniformly gray to reddish-tan body color, and long tail - nearly three feet (1 m) long and a third of its total length. The muzzle and chest are white and there are black markings on the face, ears and tip of the tail. Cougar kittens are mottled with black spots and have ringed tails until they are about 6 months old. The cougar is the second largest cat in the New World. (The jaguar is the largest.) An adult cougar can range in length from 42 to 54 inches, with a 3-foot-long tail. Adult males weigh up to 200 pounds, and adult females up to 120 pounds. Like all members of the cat family, cougars have five digits on the forepaw and four on the hindpaw. Each digit is equipped with a claw, which the cougar sheathes while walking, but which it uses with deadly effectiveness when grasping its prey. The front feet and claws are larger than their counterparts in the rear - adaptations for clutching large prey. Distribution: Other than humans, cougars are the most widely distributed land mammal in the Western Hemisphere. Cougars range from northwestern Canada to Patagonia, South America. Click on a range map to see where cougars live in Washington. Habitat: Cougars normally are reclusive animals which avoid humans. They make their dens in rocky outcroppings, dense thickets and under uprooted trees. They are highly territorial— a male cougar may dominate a home range of 50 to 150 square miles (for comparison, the City of Seattle is 92 square miles). A male cougar living in the Cascade Mountains kills a deer or elk every 9 to 12 days. They eat up to 20 pounds of meat at a time then bury the rest for later. Reproduction and Development: Cougars begin breeding at about 3 years of age and may mate during any season. Typical litters of 1 to 6 kittens are born after a gestation period of 82 to 98 days. Their eyes open in 8 or 9 days and the young are weaned in 2 to 3 months, though the kittens may remain with the mother into their second year. Tracks: Cougar tend to leave "soft" tracks, meaning the animals make very little impact on the ground, and their tracks may be virtually invisible on packed earth. Cougars keep their claws retracted most of the time, which preserves sharpness, so claw marks are rarely visible in their tracks. 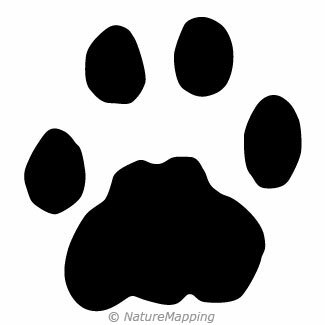 The paw print can be visible in snow (see photo). Life Span: Male cougars can live 10 to 12 years in the wild. Females normally live longer than males. NatureMapping - Project CAT (Cougars and Teaching) Project CAT in designed to provide collaborative research on cougars in rural and suburban settings to better understand cougar-human interactions. K-12 students, teachers and local community members will assist researchers in this extensive study of regional cougar populations. A cougar can jump upward 18 feet from a sitting position. They can leap up to 40 feet horizontally. 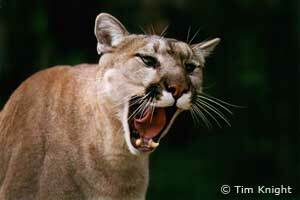 Cougars cannot roar like a lion, but they can make calls like a human scream. After the cougar is finished feeding on prey, it will bury the carcass with leaves or debris to save it for another day. Generally, adult cougars are solitary animals and come together only for mating. It is more closely related to the common house cat than to the four "big cats": the tiger, lion, jaguar and leopard. Kittens are born with their eyes closed like the domestic cat. Their blue eyes open at around two weeks and change to greenish-yellow in about 16-months. Natives of Puget Sound called cougars "fire cats" and believed that each fall the cat carried fire from the Olympic mountains to Mt. Rainier, starting a forest fire along the way. Information about cougars from the Animal Diversity Web, University of Michigan Museum of Zoology. Includes tips on traveling in cougar country. In-depth descriptions of cougars in Canada.